Yesterday’s forecasted rain missed us. We heard a little thunder off in the distance but stayed dry. The release from Cannonsville Reservoir was increased to 500 cfs yesterday afternoon. The increased released should drop the water temp on the West Branch down into Hancock. That cooler water may push the bugs on the lower West to hatch earlier in the day. We have a 30% chance of a light storm this afternoon but count on sunshine. 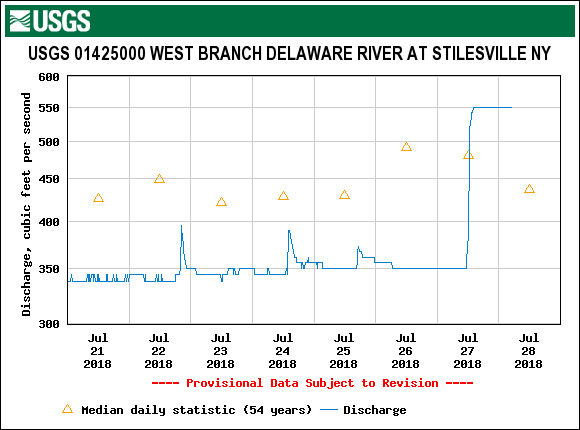 The West Branch and the upper East Branch are both in good shape for wading this morning. Sulphurs, cahills, olives, and isonychias will make up the bulk of the mayflies. With the sun and humidity we’ve had it’s time to put a few flying ants in your box just in case. The rest of the rivers in the system are dropping back and the flows will continue to fall over the next few days. Despite the higher flows there are still temperature issues on the lower East Branch, Beaverkill, and Mainstem. Stick to the West Branch or the upper East Branch for trout. As the flows drop those rivers will heat up again in the sun over the next few days.